THAT UPDATE RHYMED, AND I’M SURE THE NEWS WAS SWEET MUSIC TO MR. GARYN KLASEK AND MS. CLAIRE ELIZABETH BROCK’S EARS REGARDLESS. THE LAST TWO OF THE “ARPAIO FIVE” TO GET THEIR DAYS IN COURT, THE JUDGE FOUND THEM NOT GUILTY OF ALL CHARGES, AFTER A DAY OF STAMMERING AND, FRANKLY, LUDICROUS TESTIMONY FROM PHOENIX POLICE. THIS CASE IS A “KLASEK” EXAMPLE OF WHAT STATE GOVERNMENTS WILL PUT INNOCENT PEOPLE THROUGH TO REMAIN AUTONOMOUS. THESE TWO HAD TO STRESS FOR A YEAR, WHILE THE STATE OF ARIZONA TRIED TO FIGURE OUT A WAY TO SOMEHOW CONVICT THEM OF SOMETHING…ANYTHING. THIS CASE IS A RARE EXCEPTION AND NOT THE RULE. WE’RE HAPPY FOR MR. KLASEK AND MS. BROCK, BUT THE WAR AGAINST TYRANNY IS ONLY BEGINNING. 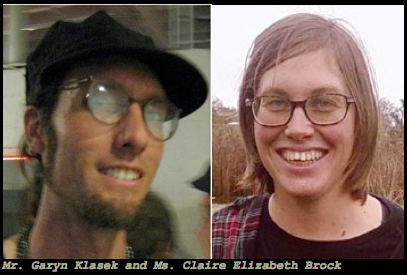 A little over one year, two trial continuances, and a few motions for new counsel later, Mr. Garyn Klasek and Ms. Claire Elizabeth Brock finally had their day in court stemming from an anti-Joseph Arpaio protest on January 16, 2010 in West Phoenix. Mr. Klasek, Ms. Brock, and three others were arrested that day on various charges ranging from assault on police officers and resisting arrest, to disorderly conduct and other arbitrary felonies and misdemeanors. Three court reporters, the judge, and some friends of the defendants were present in the courtroom. There was no jury present for the bench trial. State’s attorney Kevin Okono called four Phoenix police officers to the stand, all of whom testified that Ms. Brock “jumped on” Mr. Klasek’s back as police were trying to subdue him, and “tied a dog collar” around his neck, which was connected to a chain that was wrapped around Ms. Brock’s waist. On cross-examination by defense attorney Mikel Steinfeld, none of the four police officers could give a description of the alleged “chain” and “collar,” and it was established that no “chain” or “collar” was booked into evidence upon arrest. When asked directly if he found the chain and collar, Officer Joshua Calle responded, “no, I guess not.” Mr. Klasek and Ms. Brock, sitting at the defense table, tried to contained their giggles, as the police described, but could not substantiate this episode they claim happened. It was further established today that the Phoenix Police did not identify themselves as police officers as they were taking the two Defendants to the ground and handcuffing them. Each of the four officers, when asked directly by Steinfeld and Ms. Brock’s attorney, Bobby Thrasher, admitted they overlooked identifying themselves as officers of the law. Maricopa County Commissioner James T. Blomo had to interject at one point and pose the identity question directly to Officer Calle, to make certain what he had heard was correct. The attire the officers were wearing during the protest was also in dispute, as all of them gave varying descriptions of what they were wearing to identify themselves as obvious police officers, thus, from the state’s perspective, they would not have to identify themselves verbally as officers. None of the four officers could positively identify Mr. Klasek or Ms. Brock as the individuals who threw bottles at them (assault on police officer charges), and only one of the officers, Alistair Morrison, gave testimony about the bottle throwing incident without stammering. Morrison also admitted to not identifying himself as a police officer. He did, however, positively identify Ms. Brock as the female who allegedly jumped on Mr. Klasek’s back while being arrested. The other three protestors who were arrested that day – Issa Emadi, Sarah Grace Daniels, and Jeremiah Henry – have since ended their judicial proceedings. Ms. Daniels recently completed a 30-day jail sentence and is now serving 18-months probation, after signing a plea agreement she was forced to accept, or face ten years imprisonment. Mr. Emadi plead guilty to misdemeanor disorderly conduct last May and recently completed six months of probation. All charges against Mr. Henry were dismissed last July after the state of Arizona realized there was no way to pin any charges on him without spending money going to trial. Proceedings resume tomorrow at 10:30 a.m. We will update after tomorrow’s proceedings. This entry was posted in Tempe and Maricopa County Arizona News and tagged Claire Brock, Garyn Klasek on February 2, 2011 by admin. Thanks for covering this, Brian. Even if I wasn’t sympathetic to the Anarchists among us, I’d still be pissed about my tax dollars being wasted on this vendetta against the Arpaio 5. Bad enough what they did to Grace. I can’t believe the prosecutors saw fit to go after Claire and Garyn with this nonsense and not prosecute the officers responsible for the death of Marcia Powell. The state has no evidence of a crime, no witnesses who actually saw anything, and no case. I believe the 3rd or 4th cop that was examined said that Claire grabbed onto the leg of the officer that was arresting Garyn- not onto Garyn. I hope the defense caught that.